Follow these simple recipes for time-honoured cakes, bread and pastries, then sit back and feel your comfort levels rise. Mix the yeast with 150ml of the water. Set aside for about 15 minutes until it begins to froth. Mix the flours and salt in a bowl. Make a well in the centre and pour in the yeast liquid. Mix into a dough, adding the remaining water as necessary (you may need a little more or less). Turn on to a floured board and knead for about 10 minutes until smooth and elastic, but not sticky. Sprinkle on more flour as needed. Put the dough in a clean bowl, cover with lightly oiled clingfilm and leave in a warm place until doubled in size (about 1 hour, although this can vary). Meanwhile, preheat the oven to 220°C, gas mark 7. 'Knock back' the dough by kneading briefly to expel the gasses. Shape into a loaf and place in a 900g loaf tin. Leave in a warm place, covered, until increased in size by half again. 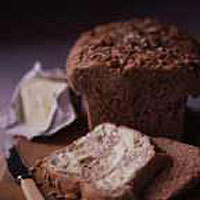 Brush the top of the loaf with milk and scatter with a few pine nuts and sunflower seeds. Bake for about 20 minutes or until the crust is crisp and the base sounds hollow when tapped. Cool and serve. Eat within 2 days.